In 1987, the Maine Legislature amended the Maine Hazardous Waste, Septage and Solid Waste Management Act in response to concerns about the potential public health and environmental hazards posed by medical waste. The Amendment defined pathogenic and infectious wastes as hazardous waste and directed the Board of Environmental Protection to adopt rules regulating the handling and disposal of biomedical waste. Public concern was driven by a series of hypodermic needle wash ups on popular public beaches and the emergence of several highly infectious diseases. The Board of Environmental Protection adopted 06-096 CMR 900, the Biomedical Waste Management Rules in 1989 with an effective date of 1991. There are no medical waste management rules administered by the United States Environmental Protection Agency. However, the United States Department of Transportation does specify packaging and regulate the transportation of medical waste and the United States Occupational Health and Safety Administration administers the Bloodborne Pathogen standard to protect employee health and safety. 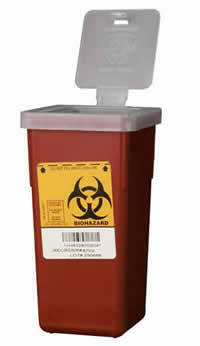 For more information on Biomedical Waste contact Michael Parker 287-7704. Registration of Medical Facilities, General Information - Answers to some common questions. See below for registration forms. Active Biomedical Transporters - (pdf format) 1 Page - List of Active Biomedical Waste Transporters. This list is updated at the beginning of each month. What to do if you find a discarded syringe?